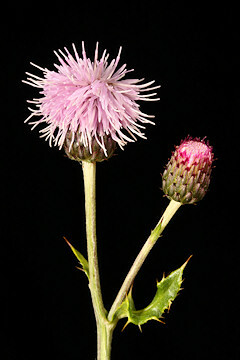 Creeping Thistle, sometimes called Field Thistle, is a very common weed in Britain. It thrives in fields and meadows. 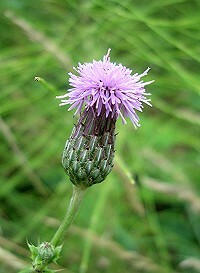 It has clusters of pink/purple flowerheads up to about 2 cms across. Unlike other thistles, the stem is not winged or spiny. The leaves are long, narrow and very spiny. As the name suggests, Creeping Thistle spreads underground, creeping through the soil.